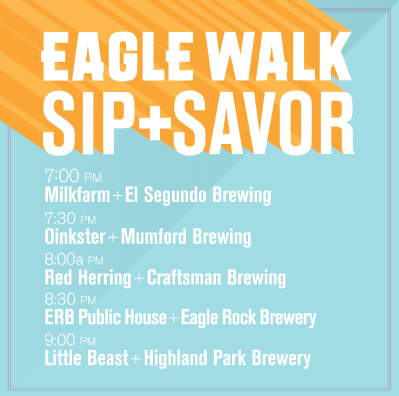 Come join us for the inaugural Eagle Walk: Sip & Savor Event! In this unique pairing event, guests will get to experience a progressive meal perfectly paired with locally brewed beers. Each course is at a different restaurant however, so that guests can get a taste of the local dining scene as well as experience the neighborhood on a guided 1-mile stroll through the neighborhood. Participating brewers and restauranteurs will be on hand to discuss their beer and food pairings, so you can rub elbows with some local brewery, shop/restaurant owners, learn about their products and businesses, and learn about why food and beer pair so well together. 7pm MilkfarmLA + El Segundo Brewing Co. The $47 ticket includes stops at 5 local restaurants with a beer and food tasting at each one, hang-time with local brewers and restauranteurs, and an opportunity to meet some really cool new friends with similar interests (at least in food and beer). Please note: Tax and tips are included in the cost of the tickets (though you’re welcome to tip service staff more). Comfortable walking shoes are encouraged (all locations are also wheelchair accessible). Additionally, if you park at the first location, you’ll get a little more exercise on the 1-mile walk back to your car.